Mind blown! You guys know how much I love amaebi, right? We had to visit the KCC Farmers Market for their fresh catch. We got their garlic amaebi yakitori and also tried their grilled abalone and abalone poke. Absolutely amazing! Tip: Open every Saturday at 7:30 am so get here early because it does get crowded with long waits for food. Since we arrived early, there was no wait! 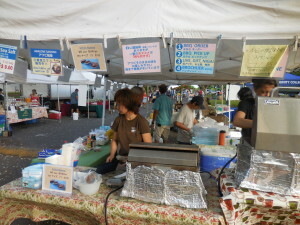 The KCC Saturday Farmers’ Market is located on the Kapiolani Community College Campus in parking lot C . Open every Saturday from 7:30am-11:00am!